Jens Müller, along with two other researchers at the Ruhr University Bochum, wrote about their findings yesterday in a blog post. They also released a Wiki page and an open-source toolkit, which can be used to either take advantage of the security flaws or test if a printer is vulnerable. 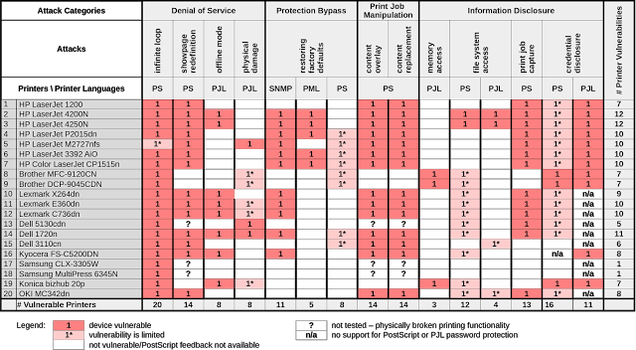 As you can see from the chart, the researchers claim that a given printer could be locked up by a DDoS attack or be reset to its factory defaults. More troubling, however, is the ability to capture potentially sensitive documents as they’re being sent as a print job. In a worst case scenario, the researchers say a hacker could use the printer as an entry point to pull an organisation's network credentials and gain higher levels of access. Müller told ZDNet that he needed a subject for his master’s thesis and noticed that there are very few scientific papers on printer security. He also said the bugs they are calling attention to aren’t new—they’re mostly just overlooked.